The Green Light project was a fantastic musical journey of experimentation and collaboration between a diverse team of tutors and participants. 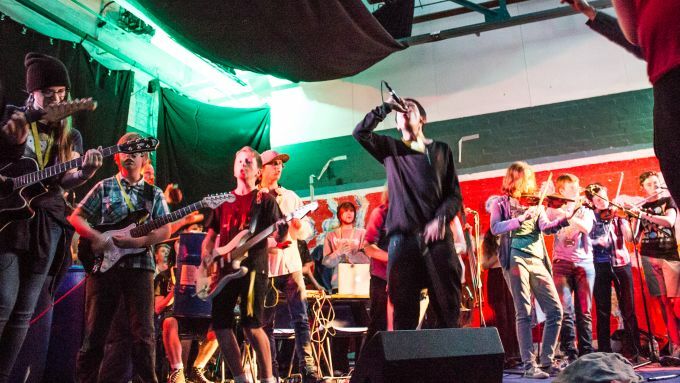 The project was established for the East Sussex Music Hub (Rhythmix, The East Sussex Music Service, AudioActive and Martlet’s music) to share ideas, skills and experience to create “A genre defying youth music ensemble” which was undoubtedly a huge success. Staged in a unique venue , The Depot – The former Harvey’s brewery warehouse in Lewes, the final performance was an exhilarating mix of sounds, instruments and technology. The building is due to be converted into a cinema and Green Light may well have been the last event held in the historic building before work begins. The audience were then lead into the building where the clapping and chanting transitioned into ethereal singing. Strings, flutes, accordion, trombone and guitar emerged to form of a beautiful waltzing sea-shanty with lyrics inspired by Viking themes. Then, everyone was ushered to a 2nd stage where 10 electric guitars and 2 drum kits were waiting. Earplugs were handed out as a cacophony of feedback and drones merged into loud stabs and fuzzy chords. The highly energetic group were conducted to come forward and perform solos. Seamlessly, music began to appear from behind the crowd as the 3rd part of the performance commanded those in attendance to turn around. Large percussion pieces such as marimbas, vibraphones and tubular bells met digital hardware in the form of the Ableton Push and synth keys. On top of this live production heartfelt rap and singing vocals were performed much to the entertainment of the crowd. Following a short interval all the performers gathered in the large room for the main piece of the evening. The initial rhythm evolved to incorporate all the musicians for the evening as a thirty-two-piece orchestra bringing all the instruments, tech and performers together. All in all, a unique performance and undoubtedly an unforgettable experience for the artists and those who were there to witness the spectacle.